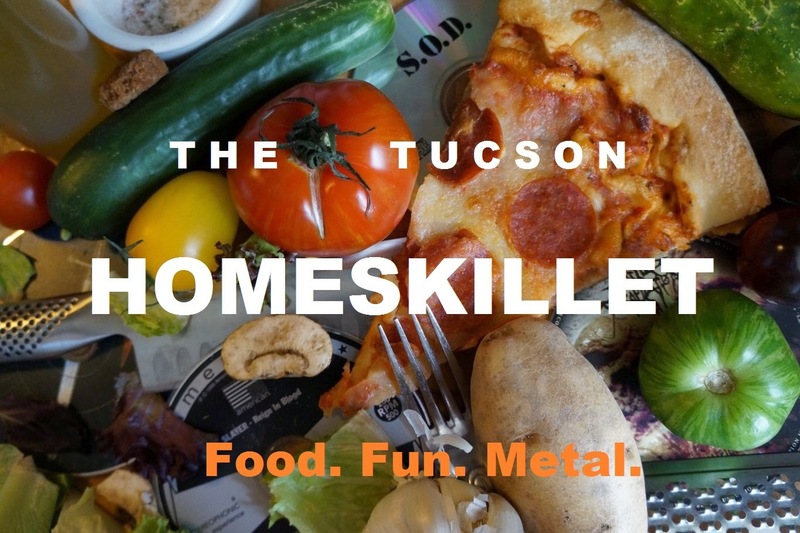 The Tucson Homeskillet: The Homeskillet Gets Down With Latin It Up! The Homeskillet Gets Down With Latin It Up! "I believe that all anybody really wants in this life is to sit in peace and eat a sandwich." It was a bright sunny afternoon just strolling along 4th Avenue when I noticed that the crepe place next to Che's was gone. "That place was pretty good," my friend interjected. "Too bad nothing really makes it in that spot." This got me thinking as to why certain areas of town are literally the death knell for eateries. Even if canteens that rock out the proper grub they can oftentimes fall subject to the "restaurant black hole", those weird corners and back areas that seem to always draw a decent concept but then swallows them whole in a short amount of time. That tight nook on 4th is kind of one of them. And, yeah, my pal was correct, that creperie did indeed have a decent product...but I suppose not one enough to keep the lights on. In its stead a colorful little sandwich shop has taken up the slot and we have a gut feeling that this one will endure summers and winters to come. Calling themselves Latin It Up, they feature a menu that is just as whimsical as the colors and decor of the place, hosting promises of South American influenced sandwiches and salads in a very relaxed environment that is both welcoming and unconventional at the same time. A nice lady at the counter with a bright yellow scarf keeping her hair back took our orders once we decided to give this place a shot. Being a big fan of Cubano sandwiches, I just had to try their take on the dish as my friend ordered up the Cilantro Chicken variety. "It's good," the lady said about the Cilantro Chicken sandwich. "You'll like it. It's a little spicy...kind of like me." Okay, that was awesome and basically made me a fan of this place right off the bat. I grabbed something called an Inca Kola and then we sat by the window and watched the flurry of 4th Avenue scoot by as we waited. "My cola tastes like bubble gum," I said after taking a sip. "Really good but...different." "Let's just say it is an acquired taste," the lady in the yellow bandana said with a sly smile and nod. Eventually the food arrived and sparked the reason for this here feature on them. Honestly, I haven't had Latin influenced sandwiches this good since some time spent in Miami or certain Latino neighborhoods in Los Angeles. To describe what separates a real Cubano sandwich from a run of the mill ham option with mayo and pickles is like trying to compare a fast food grease squish burger to a half pound grass fed beef one, cooked medium rare and dripping with well thought out goodness and meaty piquancy. It's the bread. It's the quality of the pulled pork. It's the seasoning of the ham. It's the flavor of the pickles and variety of condiments. Topped with a properly aged Provolone, Latin It Up's Cubano sent me reeling from succulent bites of the past, most coming from carts on the side of the road, cooked and served up by guys that had a little if non-existent grasp of basic English. It didn't matter because we all spoke the same language: Yummy. When the idea of a sandwich falls in the hands of well honed cooks of Cuban, Brazilian, Peruvian or Latin American decent, the result is a fantastic mash of flavors and styles that translate into one universal notion that if you are going to make a sandwich don't just make any old sandwich...make it mas que increible! "Dude my sandwich is rad too," noted my pal digging into her Cilantro Chicken sandwich. So I had to take a bite. After we finished our sandwiches and were basking in all of its asombroso-ness we just had to sit down with the nice lady in the yellow panuelo to find out what her secrets about concocting the perfect Latin sandwich in Tucson consists of...and how she got here in the first place. I mean, we just had to know. We were slightly lightheaded from the food, a rarity for us to come in sandwich form. "Well I ran away from New Jersey, my home state, around, oh, 1984...ish? ", says Irene Echeandia, owner and sandwich queen of Latin It Up. "I had a cousin living here in Tucson. But pretty soon after moving here I started to really miss my mom's cooking as well as most of the food from Hudson County which consisted of many different Latin cultures. "You know, at that time, I really had no clue as to what a taco or even a burrito was," she chuckles. "So I started to recreate my own comfort food style, taking ingredients from Southern Arizona and giving it a back east 'Latin' flair. "We previously owned and operated Irene's on Congress Street from 1997 to about 2005. In fact, we were the first Peruvian restaurant here in Tucson. "To try and heal from a tragic accident our family experienced a few years ago, my daughter Christina motivated us all to open the sandwich shop here on 4th to try and heal. We had positive, loving memories of Irene's and we feel this has been our calling. We really enjoy serving the good people of Tucson along with cooking and working with each other." With so many delicious options written down on their extensive blackboard, I wanted to know what she considers the crowd favorites or at least a signature dish...or two. "Oh," she beams looking at the menu board, "well, we are definitely known for the Cuban sandwich," to which made me smile and she smiled back. "A local publication mentioned us and our Peruvian Pork sandwich, also known as the Chicharron. Then a big food magazine came by and and really enjoyed our Quinoa Burger and the Cilantro Chicken," which made my friend up and smile. "But as far as sales go, our Beef al Huacaina (shredded beef) has been surpassing the Cubano as far as sales go. It's fantastic," beams Irene with a swish of her hand. "The beef is topped with a spicy cheese sauce then finished with a chimichurri and shoestring chips. So very very good. "We've also been serving Peruvian ceviche on the weekends. We made it recently for Good Friday and our patrons loved it so much that it has become our weekend staple. We always have specials going on so it's best that you just come on by and see what we have going on." You can do that or follow them online HERE. "We are always faced with challenges," Irene states when asked about the highs and lows of owning your own sandwich depot, especially on the busy byway of 4th Avenue, "but having faith in what we do and having a strong foundation has kept us true to our mission. "And our mission is a simple one: To introduce the community to diverse, healthy and above all hearty Latin American food. If you love food and enjoy trying out new things then this is the place for you! "We don't know where we'll end up in the future," shrugs Irene as new customers enter and stare at the beguiling display of menu items and artifacts from Brazil and Peru on their walls and shelves, "but we will certainly continue to plant healthy relationships with the good people of Tucson and serving them the best Latin food around." It's that passion that not only comes out from Irene and all at Latin It Up that makes us thankful they are open for business and seemingly doing well, but in their food as well. 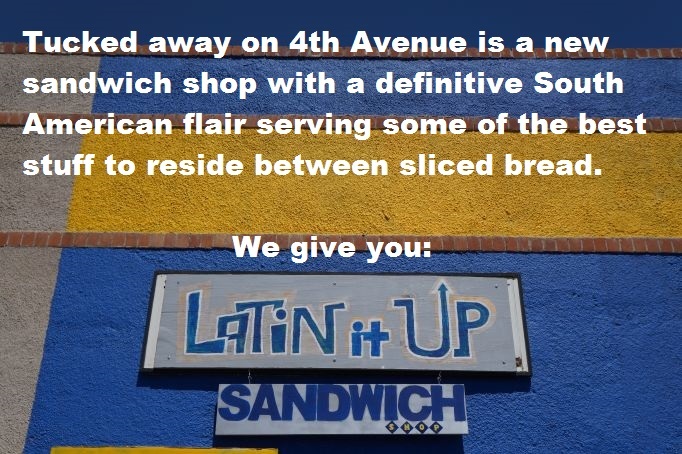 We know you're going to be on 4th Avenue sometime soon (because we all are at some point) and with all of the great food on that stretch of storefront happenings, you need to step up and into the cool South American diner and get yourself a proper sandwich. You've earned it...and Irene's inspired creations deserve the attention from your taste buds and heart as well. When we stepped back into the glaring sun of the impending summer months, our bellies were just as warm as the spring breeze that wafted down the well trod avenue. Walking away, slowly, we looked back and gave the bright blue and yellow casa a knowing grin, one that indicated that we just knew that the two of us, and the rest of Tucson, will be hanging out with Irene and her food for quite some time. Latin It Up is here and it is most likely here to stay. Gracias Irene! Your sandwiches are muy, muy buena! Now mover el culo and check it out. Thank you Latin It Up!